This is a little purse made out of SU! 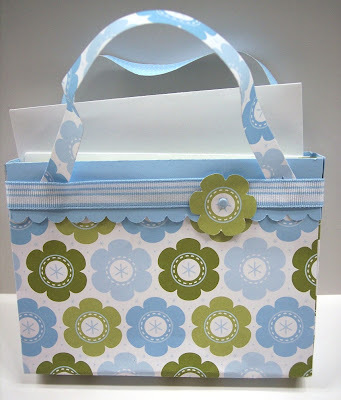 card stock and Designer Paper and filled with two handmade cards and matching envies. That adorable scallop is done with our new scallop edge punch!!! Reverisble Bird Seed Skirt GIVEAWAY!!!! I've been getting my new SU! products over the past week or so and had some free time to play with all the goodies. 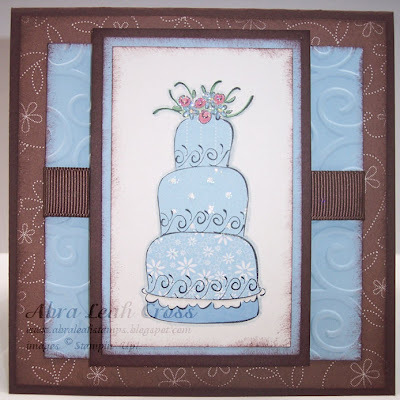 So, here are two cards made with the new Window Dressing stamp set. It's a Level 3 Hostess Set - so you can earn it for free! This set is so cute because the window is a separate image - and there are 6 little stamps you can use to add to it (and 3 sentiment stamps, too!). I was playing with this little peek-a-boo girl. She was easy to place when I used my Stamp-a-ma-jig. I have another idea I'm going to try with this set later this weekend. But, for now I'll leave you with the recipe because MIKE IS ON HIS WAY HOME!! Yup - his flight is on time and should be in Houston in a little over an hour. So, I have to get dressed and get on the beltway in about 10 minutes! I am SOOOO excited! When I was planning for my jacob's ladder album, I printed out a lot of pictures - I'm not really one to use scrap maps or sketches. I'm a scrap-as-I-go kind of girl and so sometimes I end up with more pictures than I use in my album (more of a problem with little specialty albums, not my big books). So, to use those inked, matted, and stamped photos I made a little 8.5 x 11 page for my sister (the preggo cutie in the pics!). She doesn't really scrapbook, but she is planning to put this in a frame and hang it up in her house. The retiring accessories list came out Monday, and WOW - there is a LOT on there! All the current designer paper and Simply Scrappin' Kits are on the list, in addition to any products that had this year's In Colors. But, as always, Stampin' Up! is offering a special incentive on some of the products - check out this list of accessories you can get at a discounted price! Remember, these things sell out quickly, so if you are interested in placing an order email or call me right away. You can see the full list of things on my SU! website. I cannot wait to see the new catalog!!!!!! Have you seen Pretty Pressings? Rosa stamps some of the cutest things around. 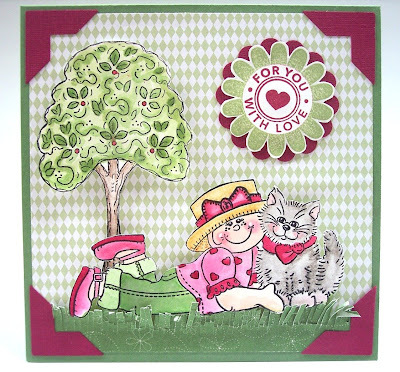 And, she is have a spectacular give-away....and if you love Magnolia Stamps, you've got to go check it out! Here is the link to the CANDY! 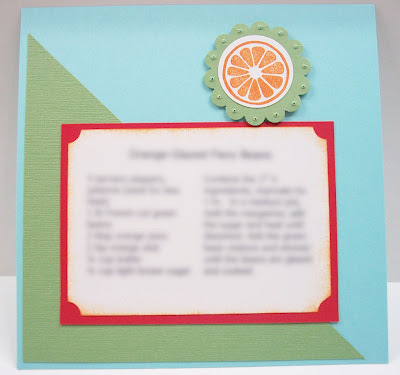 This is my first attempt at a recipe card. I'm doing the monthly swap at Courtney's and I'm excited about collecting super cute recipe pages!! This entry is for the Side Dishes catagory - I can't wait to see what everyone else does. Things have been busy at the Casa de Cross -not only have the kids been under the weather, but Mike left for England today - he will be gone for at least two weeks. It took a lot of shopping and planning to get him ready - he had never even been on a plane, let alone out of the country!!! And he and I have never been apart (in our nearly 10 years of marriage) for more than 4 days. I'm hanging in there - thanks to Skype!! We'll see how I do after a week, though! I CASEd my own card. The original was done a few months ago (you can see it HERE), and when a friend was browsing my old posts she saw it and requested something similar, but with different colors. 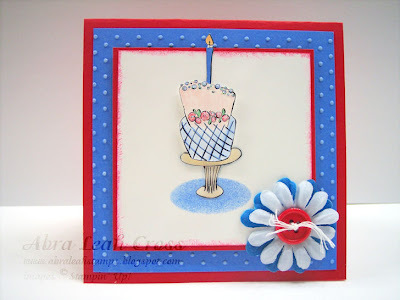 I really did mean to do the exact same card, except that I didn't look at first and had already cut my paper for a square base - so I went with that instead. When I make special occasion cards, I like to include little extras - like stamping on the inside of the card and on the envelope. 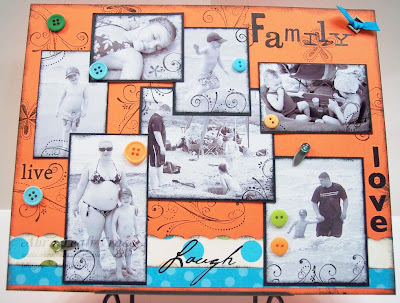 I also popped the central image up with double stacked Stampin' Dimensionals to give it more lift. And for card for more formal events, I like to add a little strip of matching designer paper to the inside of the envelope so that it all ties nicely together. I hope whoever receives it loves it! 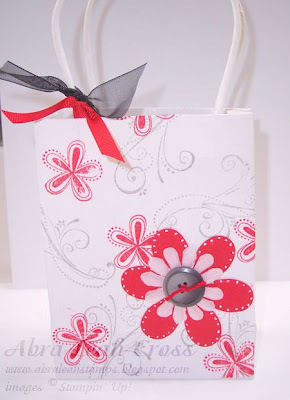 I was at Wal-mart the other day and I found these great little white gift bags by Paperbilities. Each pack has 5 micro bags ready to be embellished. The awesome thing is that they were on clearance for only $.89 per pack!!! So, I had to buy all that they had, of course! It's going to hold some PIF stuff for Meredith at A Scrap Affair. They are having a contest over there, by the way, if you live in the Houston area - a chance to win a $15 gift certificate! Go check it out. A few posts ago I shared an invitation for a 4th of July birthday party. Chloe and Bradley's friend, Korin, is turning 1 today! She is an Independence Day baby and boy does she think she's independent! Only one and already full of ambition and attitude - but she's SO stinking cute! We are about to head out the door to help her celebrate. Here is the card I made for the occasion. 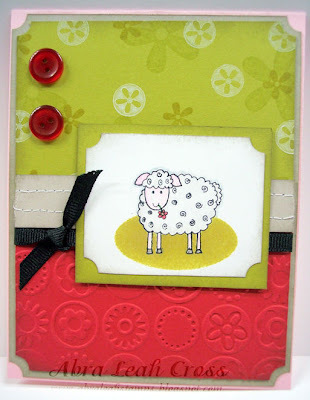 I used the Dotted Swiss embossing folder and swiped it with my white SU! craft ink pad to get the dots to pop. I'll post the full recipe later tonight - right now it's time to head to the party. Have a great 4th of July!!! This is a close-up of the cake. I've often seen this on other blogs, but I've never done it before here. 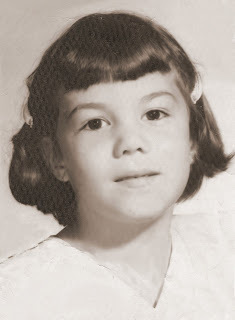 In fact, I've never requested cards before for any reason, but yesterday my mom (she turns 59 next month) slipped in the rain and fell and broke THREE ribs. She was in the hospital yesterday and I brought her home last night. Since she is older, they don't bind or splint the ribs because they worry about pneumonia. So, she is just going to be in tremendous pain for several weeks. She is stuck in bed, which is REALLY hard for her, and she is going to be on heavy duty narcotics for about a week. She is just miserable.